App updates tease arrival of Android 4.4 KitKat and Nexus 5? ...or is it? We hope so! With numerous Google apps all being updated, it seems there is something brewing over at Mountain View, something that could give us a bit of a break. Nearly all of the Google suite of apps are gaining updates, with that number currently sitting at 16, an increase from the original 12 that were spotted. 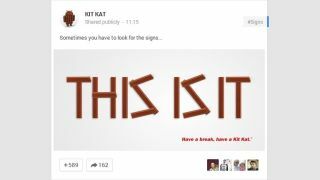 This could signal the imminent arrival of Android 4.4 KitKat, the OS update that we are heavily expecting to launch alongside the LG-built Google Nexus 5, and perhaps the new Nexus 10 tablet. App updates usually pass by unnoticed, but when 16 updates are all being spotted at once, there's definitely something fishy going on. Updated on 29 Oct 2013? But when will we get them? These updates have also not rolled out to devices, and there are no change logs (just an updated date in the Play Store), so what is Google waiting for? The easiest and most obvious answer here is Android 4.4 KitKat. We're all starting to get excited, as November 1 is a date that has been touted, and that is the day after tomorrow. We'd bet all our savings on this launching alongside at least one Nexus device: the Nexus 5. What do we know about the Nexus 5?